If you want to Import windows live mail calendar to outlook then you can get the best export windows live calendar Software that provides simple steps to export windows live mail calendar to outlook file. 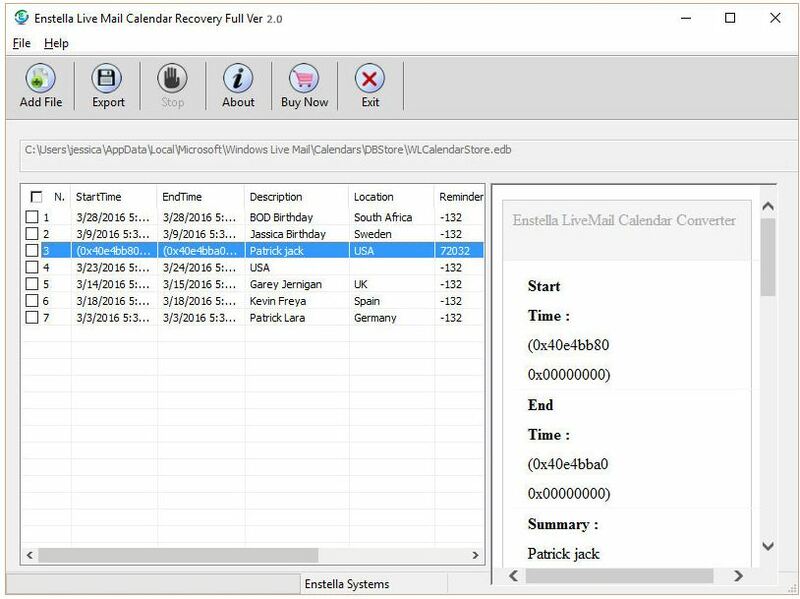 Enstella Live Mail Calendar to Outlook Converter Software is 100% safe program that easily works to recover live mail calendars items and export live mail calendar to PST Outlook file. Windows live calendar export Software shows the preview of all conversion items from live mail calendars to satisfied users and also gives users authority to import windows live mail calendar to outlook without facing any problem. Wonderful windows live calendar to outlook Software supports convert selective items from live mail calendars.edb file into outlook file by which users can save their precious time in recovery of only needed data. There the live mail calendar to outlook Software provides option to create single and separate PST file for restoring calendars.edb file with emails, contacts, calendars, task, notes and appointments. Multiple calendars.edb file emails can be converted into outlook file using the best live mail calendar to outlook Software that required the installation MS outlook for performing the task. While Export windows live calendar to PST, it will preserve folders structure and provides multiple formats: vCal, CSV, RTF, TXT, ICS and HTML to convert live mail calendars.Windows live mail calendar to outlook Software perfectly export windows live calendar and try demo version to examine software functionality with the provision to restore 5 calendars.edb items. Use the Repair PST File Outlook 2007 tool to recover emails, contacts, notes, tasks, emails with attachments, and other mailbox items from the corrupt PST file. FileTiger 1.3 (ASP) Dual-Window Synchronizer and backup tool for 32-bit Windows(XP, Me, 98/SE, 2000). Emphasizes speed, by providing two folders side by side, for moving, copying, backing up, and getting organized. From Science Translations Software.